We are about three-quarters of the way through the 2018-19 NBA season, and as playoff trees begin to grow, we can look back and laugh at some of the preseason predictions from early autumn that have proven not even close. Here are the NBA’s biggest overachievers and underachievers from each conference so far this season. Yes, the Bucks were on everyone’s list as a playoff team in the Eastern Conference. But no, nobody expected them to have the NBA’s best record from the beginning of February on. 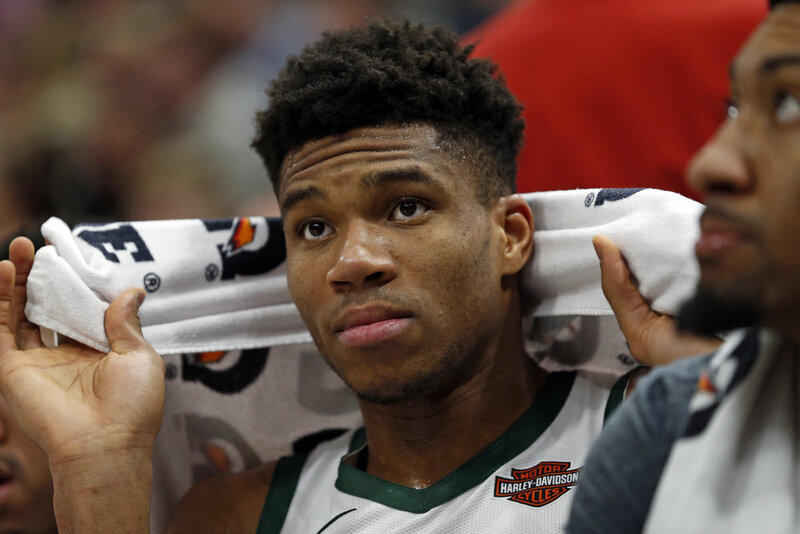 Giannis Antetokounmpo has taken yet another leap forward and is averaging 27.1 points and 12.6 rebounds per game at just 24 years old. If anybody makes a case against James Harden for regular season MVP, it’s the Greek Freak. As we can see from the Rockets, one MVP-caliber player isn’t enough to take a team to the graces of best in the league. The Bucks are also getting contributions from the reliable Khris Middleton, 2016 Rookie of the Year Malcolm Brogdon and Phoenix-outcast Eric Bledsoe. All three are averaging over 15 points per game, and their combinations of length, lateral quickness and instincts give the Bucks one of the best defenses in the league. Vegas had the number set on the Bucks’ win total this season at 48 wins. Milwaukee now sits at 48-15 with 19 games remaining to completely shatter that number. Here is the team that everybody expected to be in the Bucks’ position. The Celtics made a deep run last year in the playoffs, making it all the way to Game 7 of the Eastern Conference Finals against LeBron James. They did so without their two marquee free agent signings from that summer, Kyrie Irving and Gordon Hayward. The team played like one cohesive unit with one goal in mind: winning games. Jayson Tatum, Jalen Brown and Terry Rozier took the scoring lead, all averaging between 16 and 19 points per game throughout the playoffs. The 19-year-old rookie Tatum was the most impressive of the bunch, leading the team in points while shooting 47 percent from the field. And of course there was Al Horford, steady as ever playing great defense and making the plays that don’t appear on the stat sheet. This season, all three players have regressed. Brown and Rozier are averaging just 12.7 and 8.8 points per game, respectively. While Tatum is scoring a little more this regular season than the last, it still doesn’t live up to his playoff outburst. As a result, the team is 48-36 and are the No. 5 team in the East. The reason why they’re struggling to live up to expectations is Kyrie Irving is the wrong leader for this team. He doesn’t take any accountability for the team’s losses; instead, he throws the younger guys under the bus for their lack of experience. How are players like Tatum, Brown and Rozier supposed to be motivated to play with Irving when they don’t even know if he wants to be there? Brad Stevens has a brilliant basketball mind and is one of the best at in-game adjustments, but his ability to handle superstar egos is yet to be seen. Remember when the Philadelphia 76ers traded the Kings’ 2019 first-round pick and the number-three pick in the 2017 NBA draft to the Celtics for the number-one pick? The 76ers came away with the consensus number-one pick and eventual bust Markelle Fultz, and the Celtics came away with Tatum. The other piece of the trade, that 2019 Kings’ pick, was expected by everyone to fall somewhere in the top three. The Kings had just parted with their long-time franchise centerpiece, DeMarcus Cousins, during that previous trade deadline, and they were heavily criticised for the haul they got in return, which was headlined by Buddy Hield. That offseason, they used the fifth overall pick to select a small, shifty point guard from Kentucky named De’Aaron Fox. They then went on to win just 27 games in the 2017-18 season, giving them the second overall pick to take Duke’s Marvin Bagley III. After watching the Kings win just 27 games and seeing so-so seasons from Fox and Hield, Danny Ainge was salivating at the thought of the Kings’ pick being in the Zion Williamson sweepstakes. Vegas even had the Kings’ win total set at just 26 games, which was the second lowest win total prediction among NBA teams. But the Kings went out there and shocked everybody. The Kings now find themselves 31-31 and are just three games back of the Spurs for the West’s No. 8 seed. Thanks to Hield and Fox, this team has found an identity in the post-Cousins era. Hield has been one of the most impressive scorers in the league this season, averaging nearly 21 points while shooting 44 percent from deep on 7.6 attempts per game. Fox has taken on the role of on-court leader at just 21 years old. He’s putting up 17.2 points and 7.3 assists per game and has found the 3-point stroke that he lacked in college, now shooting 36.7 percent from beyond the arc. Throw in the emergence of Bagley, who has had himself a phenomenal February, scoring 17.5 points and 9.4 rebounds per game through the month, and this team has a deadly young big three on the rise. The strategy sounded good in theory. They would sign all of these veterans on one-year deals to keep the cap space open for summer 2019 so they can go after a big free agent. At the same time, the Lakers would have the option of developing Ingram, Ball, Kuzma and Hart, or trading them all in for a superstar like Anthony Davis. But this all only works if the players buy in to it, which they didn’t. Ingram, Ball, Kuzma and Hart had to have been hurt by LeBron and the Lakers’ attempt to cash them in for Davis at the trade deadline. Who can be motivated to play hard for a team that sees you as disposable? That message also rings true for the veterans that the team signed to one-year deals. Rajon Rondo, Michael Beasley, JaVale McGee and Lance Stephenson can’t be expected to play their hardest when they know that they aren’t a part of the Lakers’ vision of the future. On top of all of that, they look to LeBron for leadership—and he seems completely disengaged from basketball, based on his social media pages. Ingram, Ball, Kuzma, Hart, Rondo, McGee and Stephenson are all in the top nine for total minutes played this season, with LeBron and Kentavious Caldwell-Pope as the others. You aren’t going to win games and make the playoffs with unmotivated and disengaged players like this. The Lakers are 30-33 and find themselves as the No. 10 team in the West. After an embarrassing loss to the Suns last week, it doesn’t look like a playoff push is in the cards for LA.